We are pleased to announce that the FDA approved Medtronic Sofamor Danek's Cervical "Prestige�" Artificial Cervical Disc Joint Device as of mid-July 2007. For select patients this represents another major advance in the treatment of Cervical Spine Disease. For those patients with conditions that are amenable to a MINIMALLY INVASIVE approach (such as has been described in What is Minimally Invasive and Endoscopic Neurosurgery? ), we are pleased to offer this alternative. 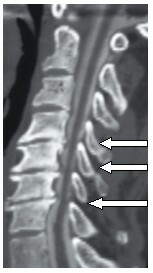 The conditions that do lend themselves to this technique include FAR LATERAL EXTRUDED Cervical Intervertebral Discs, FORAMENAL STENOSIS secondary to CERVICAL FACET HYPERTROPHY (See Figures 1, 2 & 3 below), SPINAL STENOSIS secondary to HYPERTROPHIC LIGAMENTUM FLAVUM as well as some SPINAL CORD TUMORS. 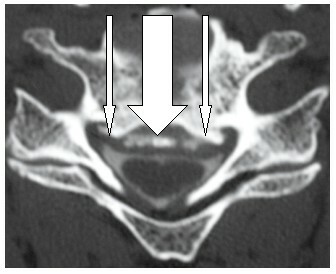 Figure 1A (Left): Post-myelographic CT Scan of C3 in a 34 year old Female to demonstrate a markedly hypertrophic (overgrown) Left facet (Arrows). The one on the opposite side is considered to be "normal". Figure 1B (Right): Post-operative CT Scan demonstrates the resection of the Hypertrophic Facet. 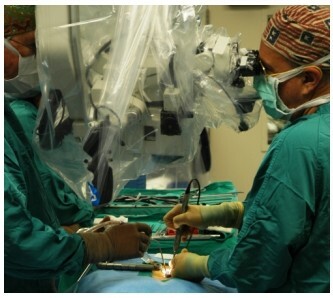 Figure 3: Operative Photo of Neurosurgical Team performing a Minimally Invasive Spine Operation. The Surgeon (Right) is looking through a LEICA OH-3 Neurosurgical Operating Microscope while working with a slender electric drill to remove bone. See Figure 3A below for a close-up view. 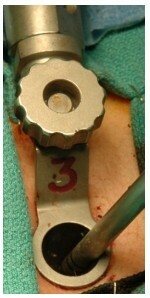 Figure 3A (Left): Operative Photo of the Drill being used to remove the Hypertrophic Facet through a 14 millimeter Medtronic Sofamor-Danek 3 centimeter long Minimally Invasive Retractor Tube. We specialize in the reconstruction of the Cervical Spine for complex and extensive problems such as high grade Spinal Stenosis resulting from Calcified Posterior Longitudinal Ligament/Large Bone Spurs as well as Cervical Bone Tumors and/or Cervical Spine Instability. We can routinely remove and replace entire vertebral bodies with highly advanced and engineered materials such as with Medtronic's Titanium "Pyramesh" Cage System. We use the patient's own bone, harvested from the vertebral bone that we remove, in order to fill the cage. This usually obviates any requirement to obtain bone from any other area of the patient nor do we generally need cadaver bone. The remarkable development of Bone Morphogenic Protein (please see the explanation in the next paragraph) has resulted in earlier, more extensive and stronger bone growth through the cage. Figure 4A (Left): Post-myelographic CT Scan (Sagittal View). 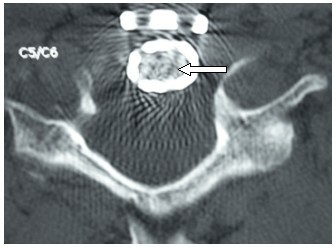 Figure 4B (Below): Post-myelographic CT Scan (Axial View-Same Patient). This patient is a 55 year old male with Neurological deficits relating to both Spinal Cord & Nerve Root injury. He underwent a COMPLETE ANTERIOR CORPECTOMY of C5 & C6 as well as SUBTOTAL ANTERIOR CORPECTOMY of C4 & C7. 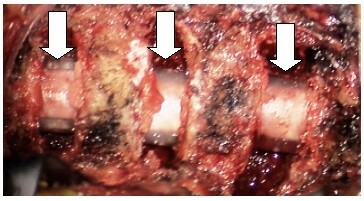 Figure 5: Operative Photo of the "Pyramesh" Titanium Cage (filled with bone kept from the removal of the Vertebra and "BMP"). The Cage has been inserted between the lower portion of the C4 Vertebra (Left) and the upper end of the C7 Vertebra (Right). The patient is lying on his back. The Spinal Canal that was previously narrowed by the Bone Spurs and Calcified Posterior Longitudinal Ligament is now widely open resulting in excellent "decompression" of the Spinal Cord (Arrow). One can appreciate the extent of removal of the C4 & C7 Vertebral bodies while retaining a sufficient amount to "anchor" the titanium cage. Bone is growing through the cage (Arrow in 7 B) and ultimately fuses the entire system from C4 to C7 while preserving the wide Spinal Canal. This patient was kept in hospital for 1 1/2 days. He returned to his work as a large animal Veterinarian after making a rapid and complete Neurological recovery. 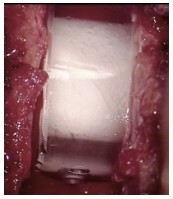 Figure 8: Operative Photo of an Anterior Cervical Fusion "Spacer"
A Bioreabsorbable "plug" or "spacer" has been filled with the patient's bone (preserved at the time of operation from the removal of the bone spurs) and Bone Morphogenic Protein (BMP). It is then inserted between the 2 vertebral bodies to restore and maintain the more normal distance between the adjacent vertebrae. Among the latest advances in Cervical Spine surgery is the adaptation of the bioreabsorbable materials for the Anterior Internal Fixation devices. 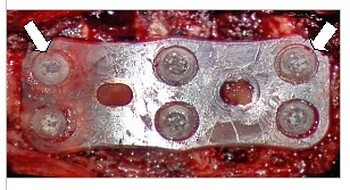 These plates and screws are now available for 1 and 2 level operations in qualified patients; however their strength is not adequate for multilevel procedures. Nevertheless, they do offer the advantage (for the appropriate patient) for the plate and screw to "disappear" in 18 months without having a permanent implant. These devices are now available from several different surgical equipment manufacturers including Inion and Medtronic Sofamor-Danek. 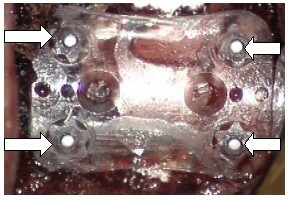 A Bioreabsorbable Plate has been inserted OVER the Bioreabsorbable "plug" and is held to each Vertebral Body with 2 Bioreabsorbable Screws (Arrows) in EACH Vertebral Body. 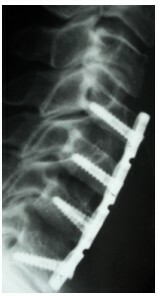 Figure 9B (Left): Operative Photo of a 2-level Anterior Cervical Fusion incorporating a Bioabsorbable Anterior Plate. The Inion Bioabsorbable 2-level Plate has been contoured to the shape of this patient�s spine and held in place with 6 Bioabsorbable Screws (Arrows) two each in the C5,C6 & C7 Vertebral Bodies. For more complex and extensive operations, it is important to stabilize the spine with a special "internal fixation" device. This is a "permanent" titanium plate placed on the front (anterior) aspect of the cervical spine and held in position with special titanium fixation screws placed into the cervical vertebrae. We utilize the latest in Aesculap, Inc. (http://www.aesculap.com) technology in the form of their Titanium ABC Plate and screw system. 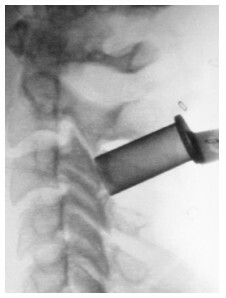 Figure 10: Operative Photo of a 3-level Anterior Cervical Fusion. Subtotal Anterior Corpectomies have been performed and 3 Bioreabsorbable "Plugs/Spacers" (Arrows) have been placed-one in each interspace. 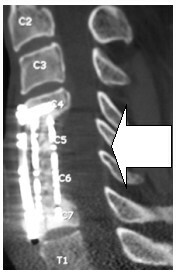 Figure 11: Operative Photo of a 3-level Anterior Cervical Fusion. 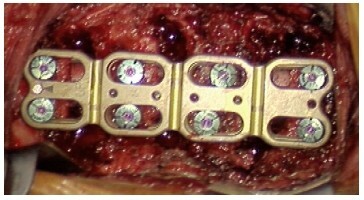 A titanium Plate is held in position with 8 titanium screws-2 in each Vertebral Body (See Figure 12 below). This patient was kept in hospital overnight. He made a rapid recovery of his pre-operative Neurological deficit and pain. One of these new CERVICAL SPINE "REPLACEMENT DISC" devices, the Prestige� Artificial Disc distributed by Medtronic Sofamor Danek, became available in mid-July 2007. (Currently there are several other similar technologies in a "clinical trial" phase awaiting FDA approval and are available ONLY ON AN EXPERIMENTAL BASIS.) For additional information about these devices, including the indications for and contraindications to their use as well as images of the devices, operative photos and x-rays of the devices in place, please consult the Cervical Spine Surgery section (Paragraph "E") on this website. The initial long term (now up to 9 years) follow-up for one such device was reported at the American Association of Neurological Surgeons Annual Meeting, San Francisco, April 2006. The report identified certain important issues that are reviewed in more detail in our documents on Cervical Spine Disease. Other scientific reports have since become available which further document the potential usefulness of these technologies. The Prestige� Artificial Disc has a history dating to 1991 and has been extensively tested both at the "bench" and in patients. Currently, it is the one device that most closely permits "normal" motion of one cervical vertebra relative to its adjacent level at the disc space. The CURRENT DESIGN RESTRICTS ITS USE TO ONLY ONE DISC LEVEL. 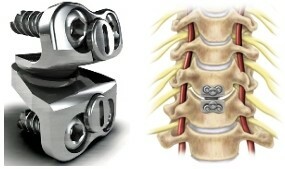 Figure 13A (Left): Photo of the "PRESTIGE�" Cervical Joint Device. This is a Stainless Steel "Ball & Trough" system that is surgically implanted between two adjacent Cervical Vertebrae AFTER THE DISC HAS BEEN REMOVED. The current version requires the surgeon to fix the new" joint" in position with screws placed into each of the affected Vertebral Bodies. Figure 13B (Right): Anatomical model demonstrating the position and placement of the PRESTIGE�" Cervical Joint Device. 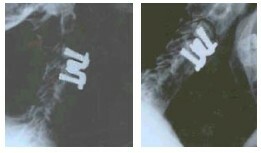 Figure 14A (Left): Post-operative X-ray (Lateral View) in "neutral" position demonstrating the "PRESTIGE�" Cervical Joint Device in place. Figure 14B (Right): Post-operative X-ray (Same Patient). The Neck is flexed forward to demonstrate the "motion" at the operated space. OFF-LABEL DRUG USE: The use of "rhBMP-2" for the specific purposes described in these sections is considered "OFF LABEL" since the FDA has not approved it for anything other than Anterior Lumbar Interbody Fusions and "Long Bone" implantation. THIS DOES NOT MEAN THE IT CANNOT BE USED. IT DOES MEAN THAT THE PHYSICIAN IS TAKING RESPONSIBILITY TO USE IT IN A MANNER OTHER THAN THAT FOR WHICH IT WAS EVALUATED BY THE FDA. THERE IS CONSIDERABLE EXPERIENCE in the use of "rhBMP-2" for the specific purposes described in these sections. We are satisfied that it adds substantial benefit for our patients' more rapid and more complete recovery. For additional information concerning "off label use, please consult the following reference. The off-label use of FDA-approved drugs is not regulated, but it is entirely legal in the United States as well as many other countries. The FDA does not regulate the practice of medicine. This means that once the FDA approves a treatment, licensed physicians can prescribe it for any purpose they consider medically appropriate. Off-label use can vary greatly from one doctor to another, and depends on the doctor's preferences, knowledge, and past patient experiences. The medical literature reports clinical trials, including those that are not part of the FDA approval process. This is the main source of off-label use information, but treatment guidelines may also offer options that include off-label use. Treatment guidelines are based on information from medical literature, including clinical trials, and explain recommended ways of treating a particular illness. Lack of information on off-label drug use and outcomes may put patients at a higher risk for medication errors and unwanted drug reactions. Every effort has been made by the author(s) to provide accurate and up-to-date information. However, the medical knowledge base is dynamic and errors can occur. By using the information contained herein, the viewer willingly assumes all risks in connection with such use. Neither the author nor Neurosurgical Consultants, p.a. shall be held responsible for errors, omissions in information herein nor liable for any special, consequential, or exemplary damages resulting, in whole or in part, from any viewer(s)' use of or reliance upon, this material. For additional information and/or to determine who qualifies for any of these procedures, please consult the Cervical Spine Surgery section on this website or CONTACT OUR OFFICE.